This is a new show on Sci-Fi Channel and I was wondering if anyone else had watched it. There have only been two episodes so far but I've really enjoyed both of them. The Dresden Files are all about the cases a Wizard Detective Harry Dresden. The show is based off a series of books by Paul Blackthorn. You can find out more about the series here: http://www.scifi.com/dresden/ So any one else out there watching this series? I've watched both episodes so far. They haven't been bad. I'll continue to watch, since I love the books the series is based on. Can't wait for the next one to come out! I haven't read the books but now that I have heard of them I'm going to see if I can find them locally. I can't wait either. Oh well not like they will show it sooner just because we want it to. If you like James Marsters (Spike from Buffy) - then try to find the books on CD! He is the narrator, and he does a really, really wonderful job of reading these books. Oh now that really sounds nice. He has such a good voice. Might have to see if I can. Each novel in the series is told from the fictional perspective of Harry Blackstone Copperfield Dresden (named by his father after Harry Houdini, Harry Blackstone, Sr., and David Copperfield). Dresden is the only professional wizard in modern-day Chicago (he is in the phone book, under "Wizards"). argh..I meant brunette instead of blond! Lol..my fingers flubbed 'cause the original Murphy was blond. I know all about flubbing, done it myself. Thank you for the more information on it. I really do need to see if I can find the books. They sound fascinating. I too love this new show. I think what I like most about it is that it portrays wicca in the right light. The wiccan creed states, "do as ye will, yet harm none." This means that we can do whatever we want so long as it doesn't hurt anyone else. I like this idea. Magick is real, I see it around me every day. Unfortunately, through bad TV shows and movies (the Wickerman for instance) portrays wizardry and witchcraft to be evil things--they are not, if practiced the right way--to do good. I find shows like this to be facinating, and hope that there are enough of us to keep them running, because you know what will happen when some high and mighty minister gets on his/her high horse about it and clames it to be blasphemy? I don't think that creating a Doomsday box would fall under the category of white magic. And neither would keeping a wizards spirit trapped in a skull instead of freeing it. there's no such thing as 'white' magick, magick is magick its how people use it that makes the difference. And wizards WOULD if they had a good reason. For example, in the books Dresden HAD to keep Bob in the skull 'cause while he was out he messed with people's free wills and made them have parties..lowered inhibitions..you get the picture. Another thing I'm waiting to see if they're going to keep..it's hard to imagine with the dude they have playing Bob now.. I liked how well they portayed magick as well. My favorite scene from the first episode was the one where he was charging that sigil on the piece of paper for protection -- and it looked exactly as it would if someone were to do it in real life. Yay for low budgets lol (they said they hadn't been able to do alot of the special effects stuff because of their low-budget..which is why they changed things from the books originally anyway). I'd probably quit watching it if it was flashy like Charmed. This is a great show. My hsuabd and I caught the repeat episode from two weeks ago and then watch the new espidoe on Sunday night. I believe that anyone who liked the X-Files or Charmed would like this show. Or even if the liked Angel or Buffy I think they would like it as well. I've enjoyed the episodes so far and I hope they continue to be as good. I might just have to check out the books as well. I have to agree with both of you guys. I loved XFiles, and Charmed, and Angel, and Buffy, and I love Dresden Files! I really enjoyed the first two episodes. I read that they're actually being shown out of order, so the one that was intended to be the first episode will air in february, and should explain more about the councils and some of the things they've alluded to on the show. I've never read the books and now I'm really curious to get my hands on them. Really? Well having more information would be nice I admit to that. I figured they'd explain more with each episode but if they are showing them out of order then that would explain a lot. 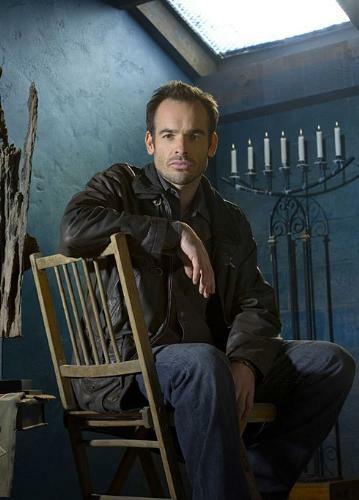 Uh..one minor correction, Paul Blackthorne is the guy that plays Harry Dresden the star. The books were written by Jim Butcher. *smiles a little* I was a fan of the books before they decided to make it a tv series. I don't get the scifi channel since I live out of the middle of nowhere and the cable company refuses to wire my house lol. So far I've only been able to watch interviews and the first episode at the library a few days after it aired on tv. Which..I'm making a trip tomorrow to watch the second episode and more interviews. Anyway..so far I love it. Yeah it's a bit shaky, but I'm confident it'll get better as it goes. Thank you. You know when I did the post something didn't look right in it but didn't know what. That's what I get for not looking at it right. Thank you for catching that and letting us know the actual author name. I'm really enjoying the Dresden Files. I enjoy detective shows and I enjoy supernatural shows, so this appealed to me immediately. I was pretty hooked on the first episode. I like Harry, I think he's a compelling character. And I like the premise and the urban fantasy setting - urban fantasy is hard to pull off, but I think the writers are doing a really good job. I'm looking forward to seeing where this series goes. I think he is too and the whole situation is well thought out and written. I'm curious to see where it goes next. I think they are showing the first two during the week so you might be able to catch them. I hope you like it. I know I did. I enjoy what I have seen of the show so far. My sister has cable at her house, but my roommate and I do not pay for cable as we are cheapskates. So my sister very kindly records the Dresden Files for me on her DVR, and I watch my episodes when I go to visit her :) The television show is not exactly like the books, which at first was a little disappointing for me. I ADORE the books, and wanted to adore the television show just as much. But - the show is still pretty good. I think I'd watch it even if I didn't like the books. I am wishing they had gone with James Marsters as Dresden - I just think of James when I think of Dresden as he is the "voice" of Harry Dresden. If it weren't for Marsters, I probably never would have discovered Dresden!! That is nice of her to tape them for you. I know a friend of mine has found them on the web to watch but I don't know where. Oh I could picture Marsters in the role. He would be good. The guy that have does a good job don't get me wrong but Marsters is unique. Yes, Marsters would DEF be great in that role :) For a time, yahoo had the first episode of Dresden on their tv site for free. My roommate was able to watch it online, which is great since we don't have cable. She enjoyed it a LOT! Are you also a fan of the books? I haven't read the books but I'm going to see about finding them. If the show is any indication I think I'd like them. It does help when the show things like that on line. I know not everyone has cable or if they do not all have the sci-fi channel. I'm glad to see more and more channels are starting to show some on line. It makes it easier for some of us. My daughter and I are both enjoying this show. It must be good to make us give up our Sunday night cartoons! Thanks for the tip on the books, I've been looking for some new reading material having gone through everything I can find by Stephen King and Anne McCaffery. must be good to get you to not watch the cartoons :) I haven't read the books but hopefully they are good if the tv show is anything to judge by. can you believe it? our library doesn't carry this series. what a bummer. Oh I can. Sounds like our libraries. They don't have a lot of books especially ones that deal with supernatural things. They seem to think everyone around here wants only romances. Yes romances can be good but I want more then that. Yes, we have seen the first few episodes and are really enjoing it. I didn't realise it was based on a book and will look into that. My whole family is a big fan of Angel and when it went off the air we weren't really able to find much to fill the gap. While this isn't quite the same thing, it looks as though it could grow into something as good. I know what you mean. With so many shows that ended there right near each other there was a big gap left. This one does help. I know some watch Supernatural but it's against CSI for me :( so I miss it. I do enjoy the Dresden files. I hope they continue to be as good as they have been so far. I not only like and watch the show I'm in search of the books. I love the way they are dealing with it so far. I think they are definitely hitting their stride with the character and the players. I saw the previews for this show and it really intrigued me I am looking forward to seeing it. I love the sci-fi channel anyway. Yeah I do enjoy the channel as well. It has some great shows on it. I hope you get a chance to see it and that you do enjoy it. I heard somewhere that they were showing the episodes out of order the way Fox did with Firefly. I'm not sure if that's true or not, but I did watch the first episode. I thought it was great, but unfortunately I missed the second episode this past Sunday. I should try to catch up with it sometime this week. I know they replayed it right after Battlestar Galactica, but I didn't get to watch it then either. I think it's a great show, another winner for Sci-fi. I had high hope for this series from the previews. But I've watched both shows and the only part I really liked so far is the ghost that comes out of the skull. It appears his uncle is going to be the one behind everything. Sor far I don't like it nearly as much as Buffy, Angel or even Charmed. But since we don't have those shows to look forward to any more, I guess Heroes and Dr. Who are my favorites now. Erm.. the series of books is by Jim Butcher, Paul blackthorne is the actor :) I like the show well enough. When I first heard that it was coming to Sci-Fi I was very excited because I'd read 7 of the books. Sadly, the show doesn't capture any of the quirks that make the books so great except for Bob. First, Harry has a faerie godmother. I think that's how he described her. This character has been fun to see drop in once in a while, I wouldn't want to spoil it though. Second, Harry seemed to have a line of women marching in and out of his life in the books although I may be misremembering. Third, I don't think they've even shown his car yet, a small detail but very humorous to me. Part of this, I don't remember them pointing out that magic effects electronics. That's how it works in the books. He doesn't have electricity in his home. No lights etc. His car is an old junker because they made quality cars that didn't have a lot of complex electronics back then. Fourth, they need to bring in the council and show the conflict between Harry and them. Fifth, while Bob is there he's different from the books. I don't ever remember him as being described as anything other than a talking skull. He does leave the skull and enter a cat though. In the show I accept this thing though because having Bob appear as a character makes him even more interesting. Sixth, the vampires really need to be introduced soon as one good secondary character comes from that, it effects a part of his love life and it's just a good source of continuing conflict. As I said, I like and watch the show but for those of you who haven't read the books, believe me, if they followed the books this show would knock your socks off. For now I'm just sitting back and hoping that the writers are already planning to include some of the things I've mentioned. Thanks, yeah I had gotten the name off another site and that's what I get for not double checking it. I knew the post didn't look right but I couldn't put my finger on it until of course it's way too late. Well it sounds like the books have some neat things in them. I'll have to find them. I hope the writers follow them and include those in there. I know sometimes books and movies/shows don't always match up besides in name but that doesn't mean they can't. I missed the episode tonight...what did everyone think? Anyone know when it replays? Tonights was a repeat of the first two episodes. Probably be on again right afterwards. They normally do that on Sci-Fi but you never know. yes it is a nice show. I have seen it.